What makes him so interesting is that his games are so diverse. His games go from 2-6 players. Some have auctions. Some don’t. Some have tile-laying. Some don’t. Some use cards. Others dice. Others wooden bits. Some are ridiculously simple to play. Some will make your brain hurt. He’s a wonder. According to Boardgamegeek, I own 45 of his games—and I’ve probably played at least 50 more of his that I don’t even own. 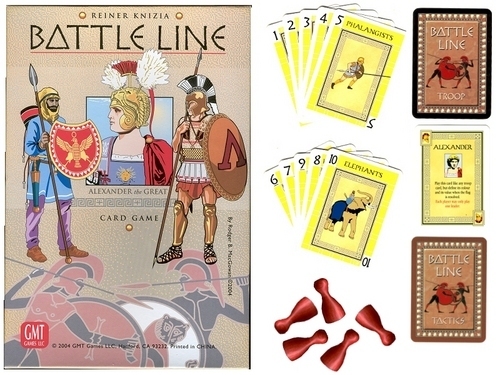 One of my favorites is a gem called Battle Line—a 2-player card game that I can’t recommend highly enough. In it you have 9 small pawns, that you place in a left-to-right line between you and your opponent; these represent battlefields. The goal is to “win” either three fields that are next to each other, or any 5 fields. Here’s how you play the game: you play a card, and you draw a card. That’s it. Super simple, right? But as with so many Knizia games, the simple play reveals hidden depth. 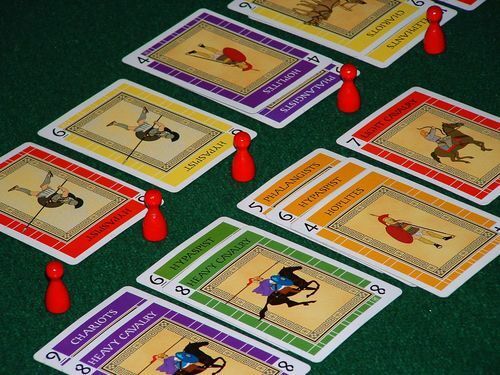 Thematically, you’re a Greek general, and you’re playing down troop cards to win battles. There are 60 cards, numbered one through 10 in six different colors. 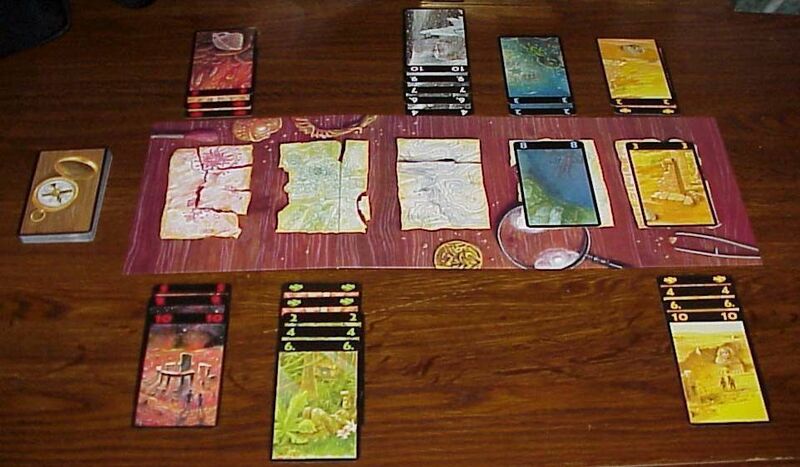 On your turn you have to play a card down to your side of one of the battlefields. Only three cards can be on each side. The way you determine who won is that you compare the “formations” on each side. They’re kinda like poker hands. Three cards in a numerical row of the same color (straight flush ) > three of the same number (three of a kind) > three of the same color (flush) > three in a numerical row of any colors (straight) > any combination of three colors and numbers (high cards). Sometimes you’ll both play three of a kind down, and the tie is broken by who has the highest numbers on their cards. At the end of your turn you can “claim” a battlefield if you’ve won it (by both having three cards down and your formation beats your opponent’s). You can also claim it if your opponent has at least two cards down, and you play your third one and there’s no way your opponent could win the battle. For instance, if your opponent has two 4’s on his side, if you play your third of three 5s on your side, there’s no way your opponent can beat you, so you can claim victory there. There’s a great deal of angst, because sometimes you don’t want to play a card down, because you’re still waiting for juuuust the right card in a few places. But you have to, so you’re forced to ditch a card on a battle you just know you won’t win. But that gives your opponent a chance to get closer to winning. It’s so tense and wonderful! As I said, the winner is the first person to win three battles next to each other, or any five across all nine battlefields. But WAIT! 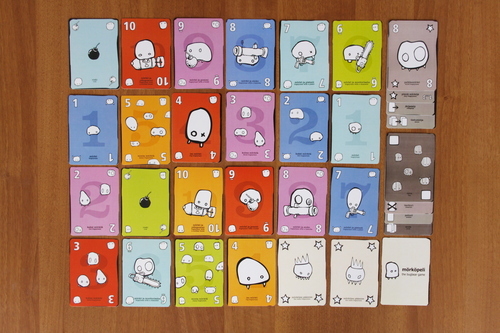 There are also some cards called Tactics cards, that let you mess with things. At the end of your turn, when you draw a card, you can draw from the regular Troops deck, or draw a Tactics cards. Those allow you to break the rules in some way. There are only 10 of them, but they can be powerful. One is a wild color; one is a wild number; one lets you steal an opponent’s card from an unresolved battle, and one changes the rules for determining winner in one battle so that it’s only the numbers that count. If I had one complaint, it would be about the theme. It’s pretty boring, and publisher GMT Games used boring artwork on the cards. They’re functional, they’re just not fun. 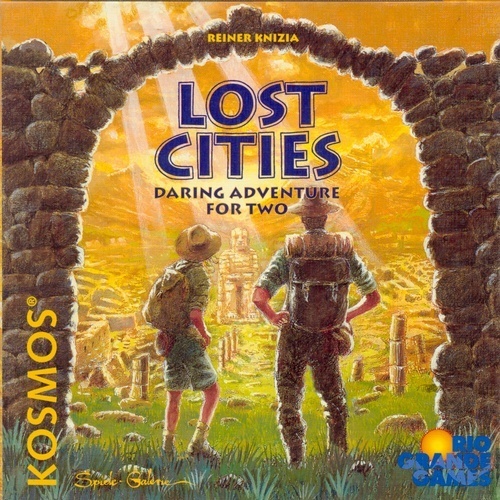 I must not be the only person who feels that way, because there are LOTS of rethemes for this game on Boardgamegeek, where people have created entirely new images to use for the game. But other than that purely subjective gripe, this is one of the best 2-player games I’ve ever played—maybe the best. It’s super cheap, so consider giving this one a whirl!